“We gained independence for ourselves, not against others, which gave us a moral substratum,” said the Prime Minister Borut Pahor at the opening of a photography exhibition on Slovenia’s 20th anniversary at Krakovski nasip in Ljubljana. The exhibition titled “Slovenia – mine, yours, ours” includes 20 photographs of the events from the 20-year period of our state’s existence; it was prepared by the Government Communication Office and was a symbolic start of the second series of celebrations of the 20th anniversary of our independence. The final event within this series of celebrations will be the central state commemoration of the Statehood Day and the 20th anniversary of independent Slovenia which will be held at the Congress Square in Ljubljana on 24 June 2011. The inaugural speaker at the central ceremony will be the president of the Republic of Slovenia, Danilo Türk, Ph.D.; after his speech, an artistic part of the state ceremony, titled PogUM (Courage), conceived and subscribed by the director Matjaž Berger and his co-workers, will take place. The ceremony of 20th anniversary of Slovenia’s statehood is placed in a symbolic space of the Ljubljana Congress Square and the University’s volume. Symbolic points of Slovenian spirit are lining the horizon where the statehood is articulated as a succession of solemn postures: dignity, honor, courage, love, utopia, creativeness, victory. Postures are mental gestures, they are poetic deeds and they are ethical bets – of individuals as well as of the community. Only such creative postures can give birth to positive principles that think of modern and future as a "principle of hope” (Ernst Bloch). Therefore, the high anniversary of a prudent and brave posture that gave birth to Slovenian statehood and sovereignty calls for new hopes of spirit and love utopias that will be able to think future landscapes of spirit and space of thought. Therefore, the compliment to independence and sovereignty draws from the multitude of cultures and languages of art: literature, music, dancing, film, architecture, painting, sculpture, intermedia, performative and others. Performing at the ceremony will be Slovenski oktet, Siddharta, Carmina Slovenica, Irena Yebuah Tiran, Pavle Ravnohrib, Borut Veselko, Petra Govc, Nana Milčinski, Jana Zupančič, Matej Recer, Nina Rakovec, Regina Križaj, Nadiya Bychkova, Miha Vodičar, Maša Kagao Knez, Katja Konvalinka, Marko Hatlak, Andreja Murn, Karmen Pečar, Leticia Slapnik Yebuah, Nejc Šurbek, Boštjan Gradišek, Katarina Štefanič, Brina Nataša Zupančič, Barbara Marič, Nik Rajšek, Beno Novak, Barbara Vuzem, Kim Kernand and others along with some Slovenian sports champions. The calendar of other ceremonies that will take place all over the country is also available on www.twenty.si. 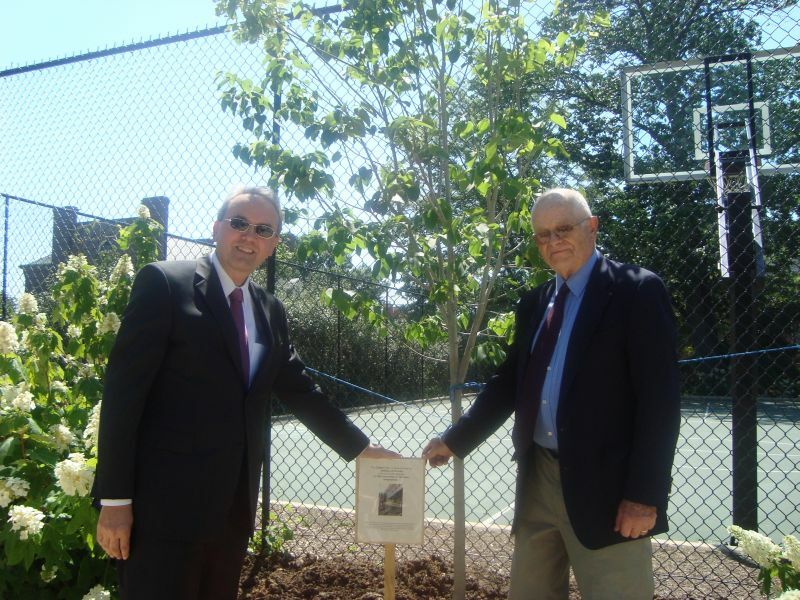 A few days before the central state ceremony we will also commemorate the ceremonial planting of a linden tree at the Republic Square in front of the Slovenian Parliament on 26 June 1991 − on the day of declaration of independence and state sovereignty of the Republic of Slovenia. At that time, Slovenia’s independence was marked also by other lindens that were planted in all parts of Slovenia. In days following 22 June 2011, the Government Communication Office in cooperation with the Ministry of Culture – National Commemorative Events Office, the Ministry of Agriculture, Forestry and Food, Slovenia Forest Service and the society Ecologists Without Frontiers organized a wider action of planting lindens all over Slovenia in order to symbolically celebrate the independence anniversary in a similar way as 20 years ago. The action was joined by many municipalities as well as local communities and primary schools. Since spring, more than a few lindens have been planted also by Slovenian embassies abroad – among others in the Netherlands, Belgium, France, the USA, and elsewhere. Lindens were planted or, to be more exact, watered also in a virtual realm. A prize game which was organized on Facebook within the application “Plant your own linden” was one of the ways the Government Communication Office wished to attract as many people as possible to celebrate the anniversary. From mid-December 2010 until the beginning of June 2011, as many as 46,173 users planted their own lindens. No less than 2,024,606 droplets of water were used to water lindens in the Slovenia Avenue. Their number is actually approaching closely the number of inhabitants of Slovenia. 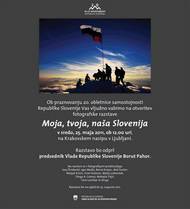 One of the activities with which the Communication Office of the Government of the Republic of Slovenia wishes to remind the inhabitants of Slovenia of the 20-year path walked so far is also a revival of a legendary TV advertisement from the marketing campaign “Slovenija, moja dežela” (Slovenia, my country). The ad is available for watching also on the special 20th anniversary web site – www.dvajset.si or www.twenty.si. The marketing campaign from the 1980’s was intended to involve the widest Slovenian public into the tourist service product. 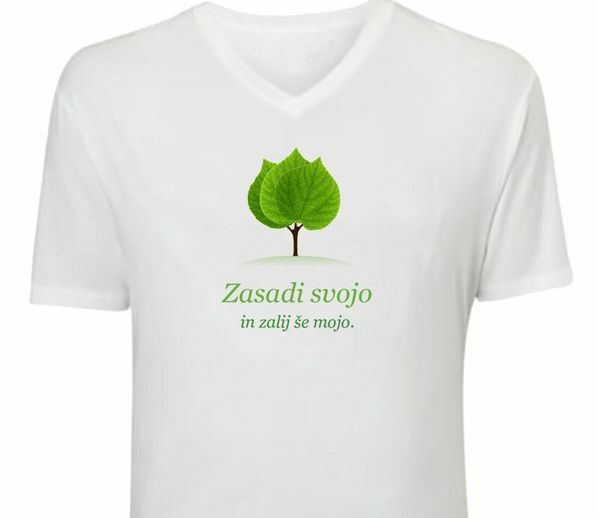 At that time, research and creative process brought about the symbol of Slovenian tourism and a slogan (Slovenia with a linden leaf and “Slovenia, my country”). 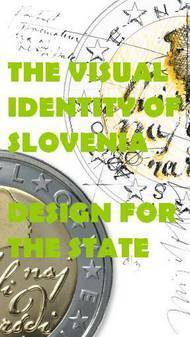 The Slovenian public completely identified with the symbol and the slogan and “adopted” the campaign which was also manifested in the awareness that the inhabitants of Slovenia are the owners of historical and present identity and responsible for the property. The campaign “Slovenia, my country” unintentionally evolved into self-awareness; it initiated the independence process and sparked self-confidence, acquiring its symbol, its slogan, its flag on the way towards independence. This year’s 20th anniversary of independence offers an opportunity to look back at the path walked by the Slovenian foreign policy. Above all, however, it offers a challenge for looking forward. In the period before us, special attention will be devoted primarily to global partnerships. In the upcoming months, a lot of effort in the area of Slovenian foreign policy will be put into our Security Council candidature. In the month of celebrating the 20th anniversary of Slovenian statehood, numerous activities to honor the solemn event will take place at diplomatic-consular missions of Slovenia abroad. At the missions, impressive achievements of our young, two-decades-old independent Slovenian state will be presented to the guests abroad through the organization of various concerts, performances, exhibitions, round tables and other activities. Ceremonies and celebrations will continue also after 24 June 2011. Thus, on Friday, 1 July 2011, Slovenians living in neighboring countries and around the world as well as expatriates will gather in Ljubljana at the gathering of Slovenians from around the world and expatriates, under the resounding title “Welcome home!” In the city center, stands of Slovenian societies from around the world and from the neighboring countries will be set up; besides, various organizations active in the area of expatriation will be presented. The event will be variegated by culinary delicacies and traditional Slovenian products as well as by performances of music, folklore and theater groups preserving and developing Slovenian culture also far beyond our borders. The performing guests will be Slovenian expatriate and across-the-border musicians, dancers and artists coming from Belgium, Croatia, France, Serbia, the USA, Bosnia and Herzegovina, Germany, Italy, Austria, and Argentina – therefore, virtually from everywhere. Among others, the rock band Bališ from Carinthia, the band BK Evolution from Venetian Slovenia, an orchestra, choirs, dancing and theatre groups from Slovenia, from neighboring countries and from around the world will present themselves at various street locations across the city center. The gathering will end in the evening hours at the Prešeren Square where inaugurating speeches will be followed by a multimedia performance by Sounds of Slovenia/Sozvočja Slovenije which will present Slovenian traditional heritage under the artistic leadership of accordion player and composer Janez Dovč. For this special occasion, the world-class opera singer Juan Vasle and united choirs from neighboring countries and from other parts of the world will join permanent members of the Sounds of Slovenia which is composed of exceptional Slovenian musicians such as Eva Hren. As an accompanying program of the event, projections of films covering emigration will take place under the organization of Kinoatelje from Gorica/Gorizia, three exhibitions – one will present works of annual guest painters, the other will present Slovenians around the world during the time when Slovenia was gaining its independence, while the third will include works of an artist with Slovenian roots from Argentina. Apart from the above listed events, a show with experiments for children will also take place that day, while a day earlier a round table about the position of Slovenians around the world is planned to be organized. Within the event, the 4th football tournament of Slovenians around the world will be held in Ljubljana in the end of July. 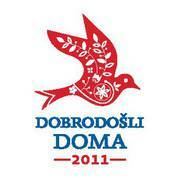 More information is available on the web page www.dobrodoslidoma.si and on Facebook. The Slovenian Tourist Organization helped all Slovenians, their offspring and friends in easier deciding about visiting their homeland by preparing numerous actions and favorable options that can be checked on www.slovenia.info/homecoming. The site with announced special tourist arrangements and packages is also intended for the exchange of impressions and memories of the ancestors’ land of origin. The exhibition “Slovenia – mine, yours, ours” includes 20 photographs of the events from the 20-year period of our state’s existence. Slovenian linden tree in Washington, Mitchell Park. Slovenian linden tree in Haag. Slovenian linden tree tilia cordata in Belgian Arboretum Kalmthout. T-shirts for the winners in the Facebook game "Plant your onw linden". Revival of a legendary TV ad from the marketing campaign “Slovenija, moja dežela”. The Slovenian Tourist Organization helping all Slovenians, their offspring and friends in easier deciding about visiting their homeland by preparing numerous actions and favorable options that can be checked on www.slovenia.info/homecoming.